The Cirtek Motorsport Aston Martin DBR9 was the star of the show at the Dorchester Hotel on Saturday, March 11 – at a Diamonds Are Forever Ball, in aid of two charities. “The ball was a big success, raising over £100,000 for the two charities (MDNA and UK Cancer Research),” comments Rob Schirle. “Ric Bryan (the owner of our Aston Martin, DBR/101) hosted the event with ex-'James Bond' girl Catherine McQueen on hand to add a bit of glamour. 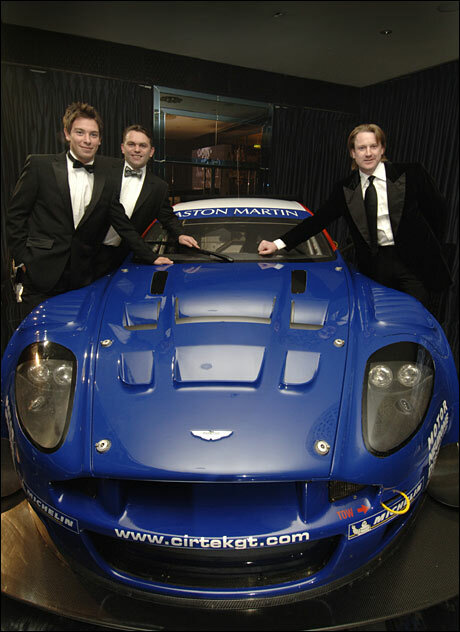 During the evening, Rob Schirle announced that Nathan Kinch will be driving “one of our Aston Martins in the Le Mans Series, with Antonio Garcia”. Ric Bryan and Cirtek will be supporting UK Cancer Research during the 2006 season, and various competitions and prizes will be announced soon. Here are Nathan Kinch, Rob Schirle and Ric Bryan at the Dorchester on Saturday night.